Home sellers and agents will conveniently write off today’s market sluggishness as typical year-end slowdown, and in 2019 they will simply do what they’ve always done – put a bloated list price on their real estate. You can’t blame them – it’s their chance to win lottery-type money. If you got to name any price, you’d want more, not less, right? It is a common mistake to over-price a home though, and homebuyers need to beware. But over-pricing has been around since the beginning, and is just a reflection of how motivated the sellers are – which in 2019 will be ‘not much’. What are the additional challenges that will be with us in 2019? A. The realtor industry favors the home-sellers. Realtors have a contract with the sellers, so no surprise that listings are the name of the game. But now that realtor teams dominate the landscape, the new and inexperienced agents are dispatched to represent the buyers – who won’t be too impressed with the lack of quality assistance offered on today’s market conditions. Buyers without proper guidance will be happy to stay on the fence, unless they find the perfect home, and then they will…. B. More Buyers Will Go Direct to Listing Agent. With fewer experienced agents being willing and able to represent the buyers, we’ll see single agency (disguised as dual agency) become more popular than ever. Consumers don’t really seem to care, as long as the deal gets done, and listing agents encourage the idea. 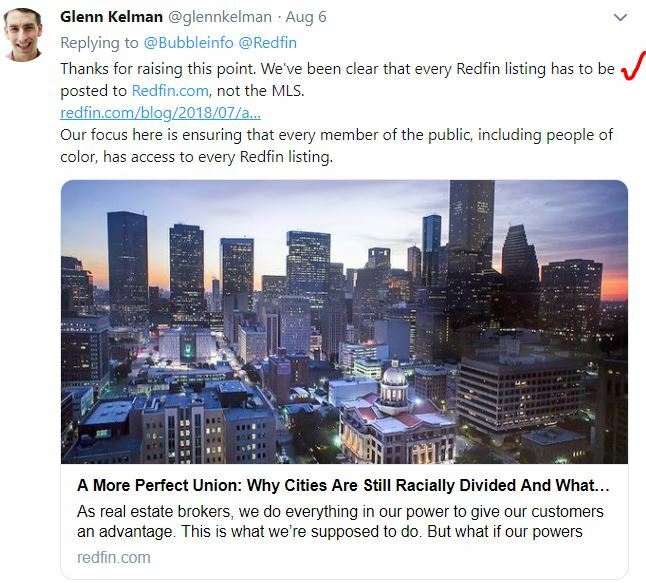 Expect more blatant attempts to exploit the practice, like…..
Glenn first played the race card and tried to disguise his coming-soon plan as a ploy to reach all consumers, rich and poor (but was going to refer low-income people to outside agents). Now he is trying to force N.A.R. to insist on prominently displaying the listing agent on all websites, with a link back to their website. If passed, will be the final dagger in the buyers getting their own representation. C. Coming Soon. The traditional brokerages are promoting their listings on their company websites before putting them on the MLS/open market, and you can’t blame them. Zillow and Redfin started it (see above), and now it’s a war. But what are buyers going to do, monitor every real estate website? Yes, at least the ones that allow you to set up auto-notifications. If you see one you like, and you inquire with the listing office/agent – who do you get? The faceless internet agent who reps the seller but will process your order as long as it’s reasonable. 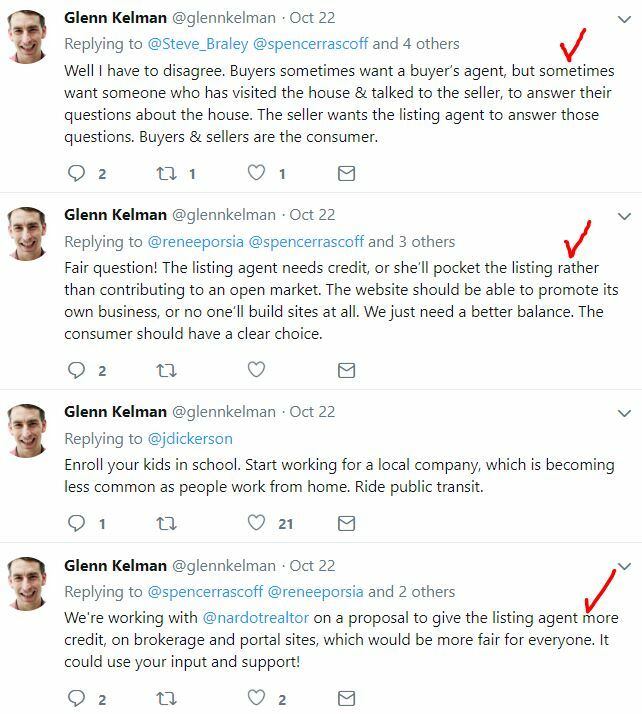 It gets worse – there is one listing agent in north county who insists that you do a 30-minute, in-person consultation and then agree to see at least two of their listings before they will show you their coming-soon listing advertised on Zillow (and not in the MLS). D. Sea Change in the Home-Selling Business. The market plateau will cause more desperation among realtors, and the disruption that everyone has been predicting will finally arrive – it will just look differently than people expected. Eliminating the traditional buyer agents will be uncomfortable, especially for older consumers who were used to having their own agent represent them in previous transactions. We should see fewer sales as a result. E. Fewer Sales Means Fewer Comps. We had 10% fewer sales in 2018, which means fewer comps to help buyers easily reach a conclusion on values. Add in the built-in reluctance to trust the listing agent and we could have a downward spiral of fewer sales….which leads to even fewer comps. Stagnant City! F. Creampuffs only. At these lofty prices and with fewer comps to justify exact values, nobody will want a fixer unless they can get a real deal. There should be a price gap of roughly 10% between the ‘puffs and the fixers in older neighborhoods, but will sellers agree? Will buyers be willing to pay +10% for a creampuff when they see a fixer down the street not selling, even when priced for less? They did in a frenzy, but now? G. Prices Might Not Change Much. Buyers going directly to the listing agent won’t find much of an audience for lowball offers. Going direct only means you have an inside shot at buying the house at the sellers’ price, not that you’re going to get a deal – unless it’s been on the market for months. H. No Help Anywhere in Sight. You won’t hear about any of these market changers in the mainstream media – instead, we will be pelted with reminders that homes are unaffordable and other doomy assumptions to explain fewer sales. Nobody will look beyond the usual excuses – instead, we’ll see more reflections back to previous cycles that have no relation. Conclusion: In 2019, potential home buyers will be hearing more doom talk and getting less help. They will see more listings at higher prices, and more escrows falling out. It will be natural for them to proceed cautiously, and be resigned to the fact that if they don’t buy this year, prices aren’t going up much so let’s be picky and wait it out – maybe another year or two! Sellers might get miffed, but they will shrug it off and blame the market or their agent for no sale. Prices won’t be going down much (mostly because only the superior homes will be selling…and getting their price). Sellers will be picky and wait it out – maybe for another year or two! In the meantime, the industry will be transitioning into single agency. Seem like some very well thought out points. I’m not so sure about buyers’ agents going the way of the dinosaur. Most buyers will realize that having somebody exclusively on their side, to provide education if nothing else, is very wise. Especially since they don’t have to pay us, lol. Can you start the “name the price”contests again? Market analysis from your readers is a good indicator. Include some homes from the “RobDog”area as well. Lets get the party started. Can you start the “name the price” contests again? Those worked better in the REO days – now regular sellers are too sensitive. But I did load up on extra Padres tickets for the 2019 season, figuring that I’ll find a way! I’m not so sure about buyers’ agents going the way of the dinosaur. Ideally, the buyer-agents would always add a valuable contribution to the equation. But Redfin has reduced them to $50 door-openers, and getting away with it. Don’t be surprised if the traditional realtor teams follow suit – and it’s already happening everywhere in San Diego. The example given in my text will be the norm, especially on the lower-end market where agents can take advantage of first-timers. Dinosaurs are circling the wagons now! A. The realtor industry favors the home-sellers. One time back in the 80’s I almost went postal. Every interested party around the table working the details of a normal buy in a normal market. As the buyer I had finally had enough. I shouted “EVERYONE here is walking away with piles of money EXCEPT me. MY money! ANYONE can walk away and the rest still get their pile of money. EXCEPT me. No money for anyone if you keep this up.” For some reason things went smoother after that. Jim, take solace in the knowledge that the most successful dinosaurs eventually evolved into majestic soaring eagles.